The middle of April coincides with traditional New Year celebrations in predominantly Theravada Buddhist countries. These are some of the most anticipated festivals in Southeast Asia. Thailand's Songkran, Cambodia's Chol Chnam Thmey, Laos' Bun Pi Mai, and Myanmar's Thingyan all occur within days of each other, derived from the Buddhist calendar, and scheduled to coincide with the end of the planting season (a window of rare leisure in the year's hectic planting schedule). The name is derived from the Sanskrit word samkranti (“astrological passage”), and recurs beyond Thailand’s Songkran to Laos’ Sangkhan and the Cambodian festival Angkor Sankranta. The similarities between each festival – the food, the worship, and the copious splashing of water – pales in comparison to the individual New Year spirit brought by each locale to the festive season. To understand the spirit of this New Year celebration, you’ll have to go and see each one for yourself! 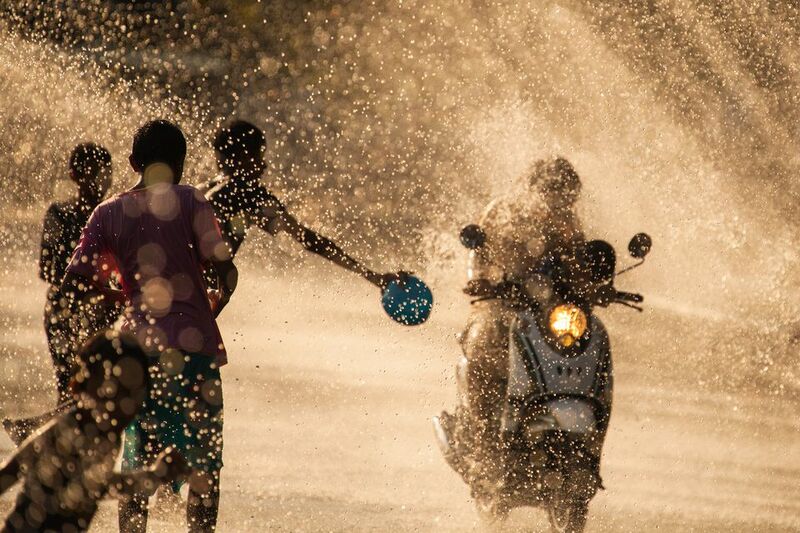 Songkran is known as "the Water Festival" – Thais believe that water will wash away bad luck, and spend the day liberally splashing water on each other. Foreigners are not spared from this tradition - if you're out and about on Songkran, don't expect to return to your hotel room dry! Songkran begins on April 13, the end of the old year, and concludes on the 15th, the first day of the New Year. Most Thais spend these days with their families, rushing home to the provinces from which they came. Unsurprisingly, Bangkok can be relatively quiet at this time of year. As Songkran is an official holiday, all schools, banks, and government institutions are closed throughout the festival’s three days. Houses are cleaned and Buddha statues washed, while younger folk pay their respects to their seniors by respectfully pouring scented water on their hands. You can stay in Bangkok to celebrate Songkran (the visitor-friendly splashing at Khao San Road is almost a rite of passage for Thailand tourists), or you can go to more historic places like Ayutthaya, where the splashing is preceded by more solemn customs like almsgiving in front of temples like the Wihan Phra Mongkhon Bophit. For the rest of Thailand’s holiday calendar, read about other Thai festivals. The New Year in Laos - known as Bun Pi Mai - is almost as splashy as the celebrations over in neighboring Thailand, but getting soaked in Laos is a more gentle process than in Bangkok. Bun Pi Mai takes place over three days, during which (the Lao believe) the old spirit of Songkran leaves this plane, making way for a new one. Lao bathe Buddha images in their local temples during Bun Pi Mai, pouring jasmine-scented water and flower petals on the sculptures. The Lao respectfully pour water on monks and elders during Bun Pi Mai, and less reverently on each other! Foreigners are not exempt from this treatment – if you're in Laos during Bun Pi Mai, do expect to be soaked by passing teenagers, who'll give you the wet treatment from buckets of water, hoses, or high-pressure water guns. Luang Prabang, as Laos’ cultural capital, retains the country’s longest-standing and most beloved Songkran traditions, from a Miss New Year pageant to fairs that supplement the Night Market to a procession that reveals the town’s namesake, the sacred Pha Bang Statue. Read about other Laos holidays. Chol Chnam Thmey marks the end of the traditional harvest season, a time of leisure for farmers who have toiled all year to plant and harvest rice. At home, observant Khmer do their spring cleaning, and set up altars to offer sacrifices to the sky deities, or devodas, who are believed to make their way to the Mount Meru of legend at this time of year. At the temples, entrances are garlanded with coconut leaves and flowers. Khmer offer food offerings to their departed relatives at the pagodas, and play traditional games in the temple courtyard. There isn't much in the way of monetary rewards to the winners - just the slightly sadistic fun of rapping the losers' joints with solid objects! The Khmer New Year is best celebrated at the Angkor Temples in Siem Reap, where the Angkor Sankranta Festival takes place over several days. Different Angkor temple locations serve as the backdrop to the varied Angkor Sankranta program – an evening releasing floating lanterns at the Angkor Wat moat; classical dance and theater recitals at the Terrace of the Elephants; and a trade fair across from the Angkor Wat entrance. Visit the official Angkor Sankranta site here: angkorsankranta.org.kh. Read about Cambodia's festive calendar. Thingyan - one of Myanmar's most anticipated festivals - takes place over a period of four or five days. As with the rest of the region, water throwing is a major part of the holidays, with the streets being patrolled by flatbed trucks bearing revelers throwing water on passersby. Unlike the rest of the region, though, the holiday derives from Hindu folklore - it's believed that Thagyamin (Indra) visits the Earth on this day. People are supposed to take the splashing in good fun and hide any annoyance - or else risk Thagyamin's disapproval. To please Thagyamin, feeding of the poor and alms-giving to monks are celebrated during Thingyan. Young girls shampoo or bathe their elders as a sign of respect. While you'll get drenched practically anywhere in public during Thingyan, when in Yangon the best place to experience the holiday is at Kandawgyi Lake, where water is drawn straight from the lake to feed the locals' need for water. Water spraying stations known as "man-dat" spring up all around the lake, all dressed up in padauck flowers (the official flower of the Thingyan holidays), and playing loud party music as their hoses drench all who pass by. The mood is near-euphoric, as locals and tourists alike enjoy the cooling effect of the evaporating water, and the occasional cold jolt of a water jet aimed their way. Certain areas are set aside to provide live entertainment – stages show live acts like the Thingyan dance called the "Yane", a group effort done in unison and in costume.